I was thinking about that, specifically one that can handle the QC 3.0, PD, as well as USB-C input and output. Any recommendations? Do anker do solar powerbanks?, that would be really cool as I’ve always wanted one. Looks good. Maximum current is 5 amps -you have to check if this is enough for your applications. You don't want one, they're just a bad idea. The solar panel is necessarily tiny, for its added weight its useless. It would take days of sunshine to recharge. The heat of sun cooks the cells and ages the battery so it dies faster. You're better either simply carrying a bigger powercore or going for a big solar panel you unfold and angle to the moving sun, and a cable to the powercore in the shade cooler. A decent solar panel, like the Anker 21W you can't buy now, in good sunshine is as fast as a wall charge so you need typically just a few hours to recharge a significant battery. However personally I did some tests this finishing with a 3 week off-grid, and to be honest I past a wall socket often enough I think it would be less hassle, more reliable, to just carry a bigger Powercore. I carried a Powercore 10000 + 21W solar and I think I'd be better carrying a 26800 instead, as it can ingest energy fast, as fast as a pub lunch period. I agree with this. I have tried several setups. 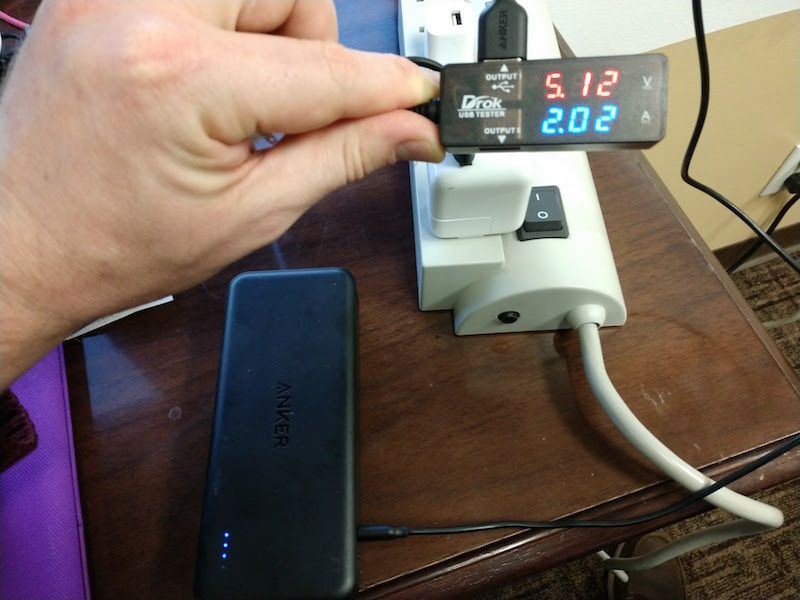 The Anker 21w with shaded large capacity batteries is my favorite and most effective. It has also lasted a long time for me. You can charge them, I've charged a 16000 powerbank with a 24watt solar panel (competitor sent me one to test) and it took all day to charge. But it was free power and perfect for off grid days. You need to be patient using these slow ways of charging. If there is no electricity at all you need patience anyway. In summer we have too much hot water, in winter when you would really need it to support the heating system, there is NO ! Solution would be to bury a huge, well isolated tank deep in the earth and to store the hot water in summer for wintertime. But its quite a good feeling. system started to boil water wasting fuel oil. New built houses are equipped with heating pumps and floor heating system and are isolated perfectly. But our old house is a good, solid house. Well, I have a handheld vacuum cleaner with rechargeable batteries. And a small solar panel. So I mounted the hook for the cleaner next to the window, put the panel in the low window corner, connected the panel to he hook - and so I always have a charged cleaner. Is on duty for many years now and still working perfectly. will still work but charge slower from the highest frequency let through e.g. blue light. Worth pointing out that anything which can be reasonably recharged from a solar panel will likely cost in electricity over many years less cost of the solar panel. When that breaks down is if you're looking at laying down a long cable. I can do the math if anyone challenges me. From a "green" perspective go large or don't bother. From a camping off-grid perspective need to go portable, large as you can carry and be away from wall sockets roughly by about a week or more to be worthwhile. I blame bad schools, they let people go into the world not able to do math. I agree window should and does reduce but I'm surprised by a factor of 3. I know hotter solar panels are less efficient so warmer indoors, against a warmer window or a warmer room? Over 10 years ago the common use case was a seldom used motor bike or spare vehicle and the garage windows were just to keep the rain out but not that intentionally UV blocking and you'd have solar there doing a trickle charge to keep battery topped up for months at a time. You're showing in effect trickle charge indoors. Now with modern electronics ubiquitous that garage which didn't electricity probably now does so the use case has reduced. BTW high latitude can offset high latitude as less air to absorb UV, and snow reflects UV so a Montana winter outdoor may make as much solar per hour as a Montana summer outdoor (just for fewer hours). Are you measuring all of these through the seasons? Down here in California near a major fault line we are encouraged to keep a pack to last 3+ days and inside of mine is a Powercore and my 21W Anker Solar. I did not know this. It is really surprising me. In the actual case with the cleaner, the panel first was built in a plastic box with - of course - plastic cover. The cover was not "glass" clear, so i removed the whole box. Therefore the panel is not more suitable for outside use. But be sure: I will keep your remark in mind, in case of any future application. Thanks a lot , @ryandhazen !!! I tried my best to control for the factors between indoor and outdoor, including using a compass to measure the orientation of the panel to the sun's location. The other factors temperature, reflection, etc) I would consider an existential difference between the indoor and outdoor applications - basically, I wanted to know if I could get as much charge from setting up my panel in my office vs setting it up outside. That room (my office) certainly was warmer than the outdoors that day (by about 50 degrees F I'd say), so it could certainly be a factor. However, I've measured those panels performing at 10w on one outlet (into that same powercore II) or better in summer months when the ambient temp was much hotter than the office (by about another 25 degrees F), so I wouldn't think the temp could have such a great impact. You point out another good factor to keep in mind, that the quality of the window is important. The window I have in my office is part of a college library (not a residence) that was built to meet stricter standards than the average home. It may be that those industrial windows have additional coatings or glass types that aren't your average window. They were built to store books, after all, and may have some additional protection so that the books aren't slowly degraded by sunlight on their shelves. They may also be stronger to add R value on such a large, open building as this library, saving the institution money in the process. I just don't know any of that for sure. It recommends a test at home (both in my living room and garage). I think i'll get that new meter and get to work.